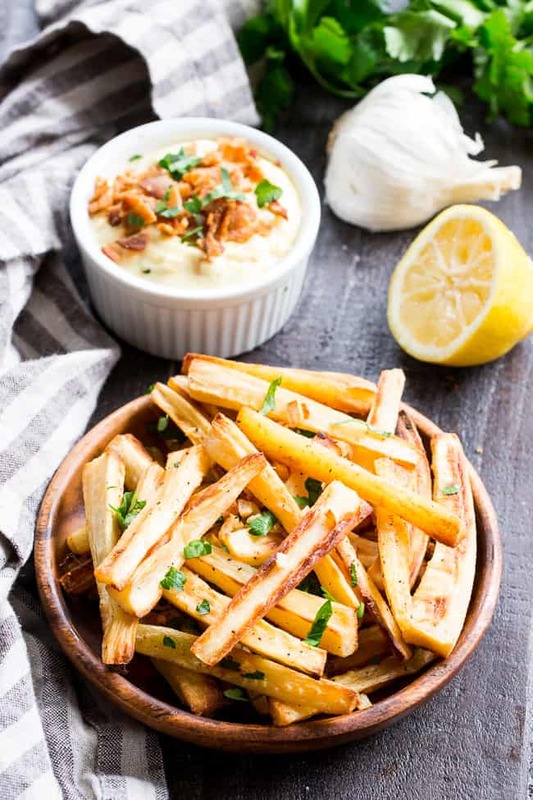 These crispy baked garlic parsnip fries are easy and totally tasty with any main dish! 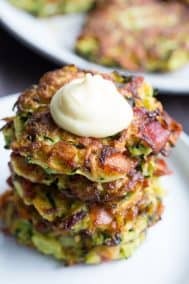 Lower in carbs than potato fries and packed with flavor, with a creamy, tangy, bacon aioli for dipping. 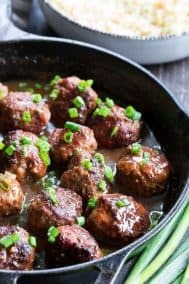 Kid approved, Paleo and Whole30 compliant, perfect side dish or appetizer. Fries and dip make food fun. Or rather, make fun food even more fun? 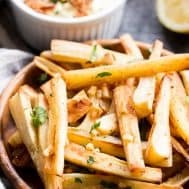 I’m not sure, but all I know is that I’m certain my kids would not be eating parsnips if I didn’t bake them up as crispy fries. Yup, I’m MORE than totally certain of that. You see, even though I’ve been cooking paleo meals for years, my kids are still not veggie lovers. There, I said it! Specifically though, the littlest of the three, who’s now almost 7 (somehow), is still rejecting veggies like a toddler. Ugh. However, he’s a big fan of veggie FRIES, and well, honestly, so am I. 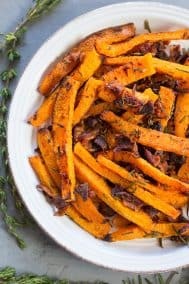 Of course my go-to veggie fry is the almighty sweet potato fry, but even I get just a smidge tired of buying and cooking sweet potatoes like they’re all I live on. I live on other things too, I promise. Anyway, for some reason I only whip out the parsnips when I’m doing the Whole30 – shame on me! Because they’re DANG delicious – not only roasted into fries, but in hash recipes too. 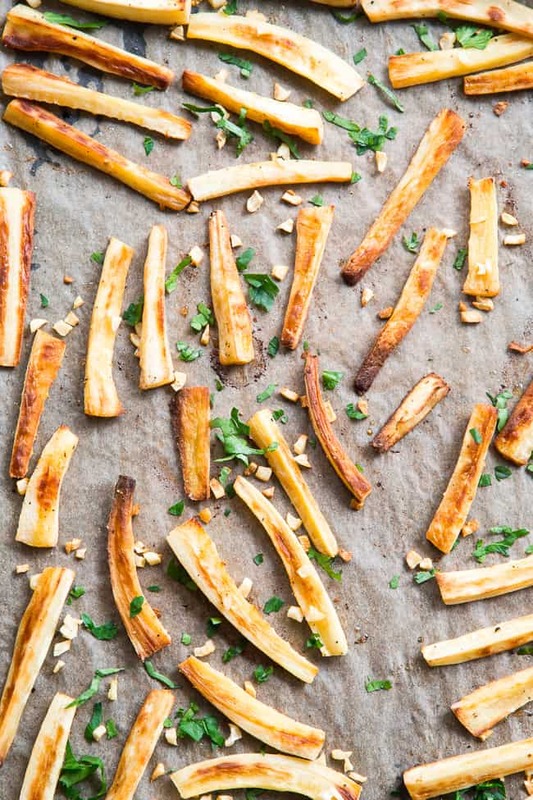 Plus, they’re just so easy to make – as all veggie fries are – once you get the hang of the whole crispify-ing thing. Trust me, crispy baked fries used to be a mystery to me too! In the photo above you can see at least a couple of my crispy-tips. First, a dark baking sheet lined with parchment paper. It just works – I can’t completely explain it. Second, you need to evenly coat your fries with fat – in just the right amount. I used melted ghee, but you can also use avocado oil, melted coconut oil, or light flavored olive oil. Third, let those fries BREATHE! 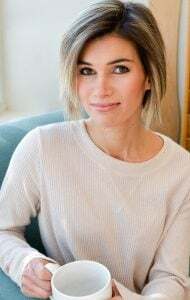 Not only should they be in a single layer, but they shouldn’t touch each other at all – they need lots of space to avoid getting moist and soggy. For parsnip fries, I go with a 425 degree oven, which is lower than I use for sweet potato fries, but I find parsnips burn more easily at such a high temperature. 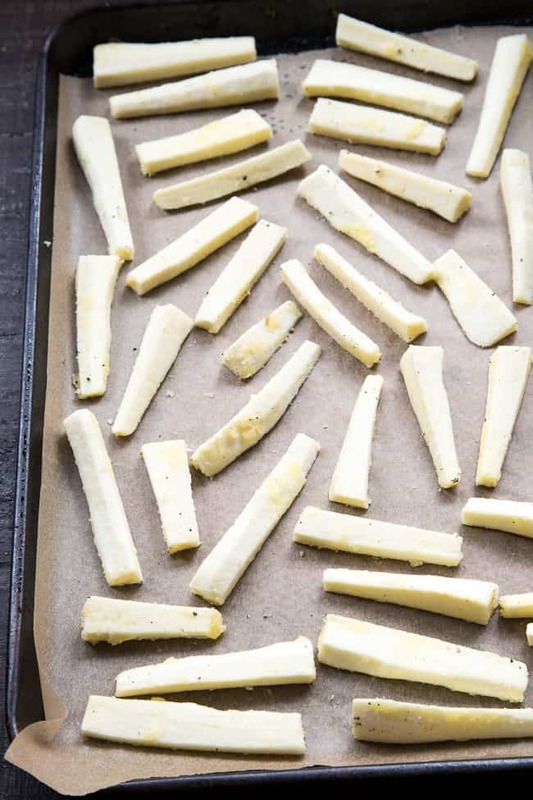 Another anti-burn tip is to place the baking sheet on a rack in the upper portion of your oven – this makes a big difference for any fries! For these, I decided to roast them with garlic for the last portion of the cook time. 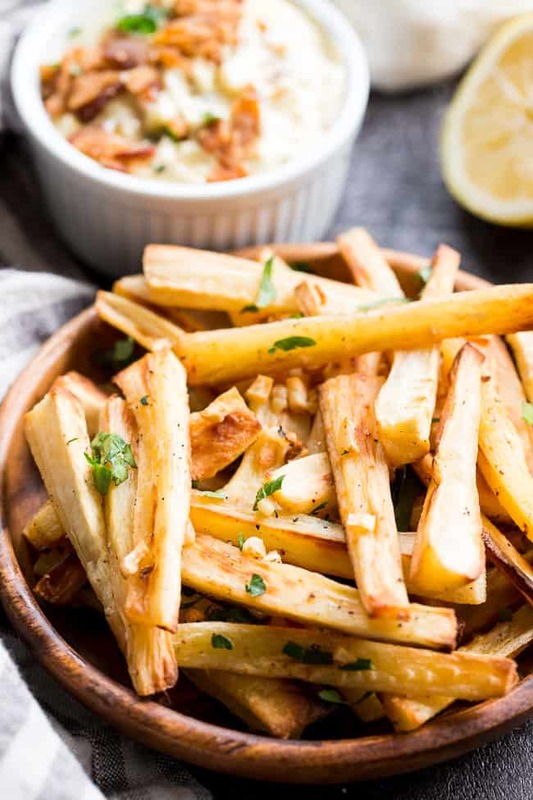 Garlic burns easily, so you don’t want it in the oven with your fries too long – it’s best to wait until they’re more than halfway there before sprinkling it on. Am I forgetting the dip?! Heck no – it’s SOOO tasty! At first, I was planning to roast some bacon along with the fries themselves, but then I decided the bacon was better off in the aioli itself. 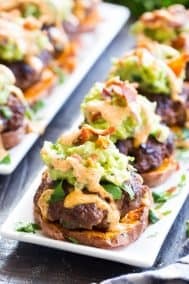 Good decision on my part – this easy bacon aioli can do no wrong! 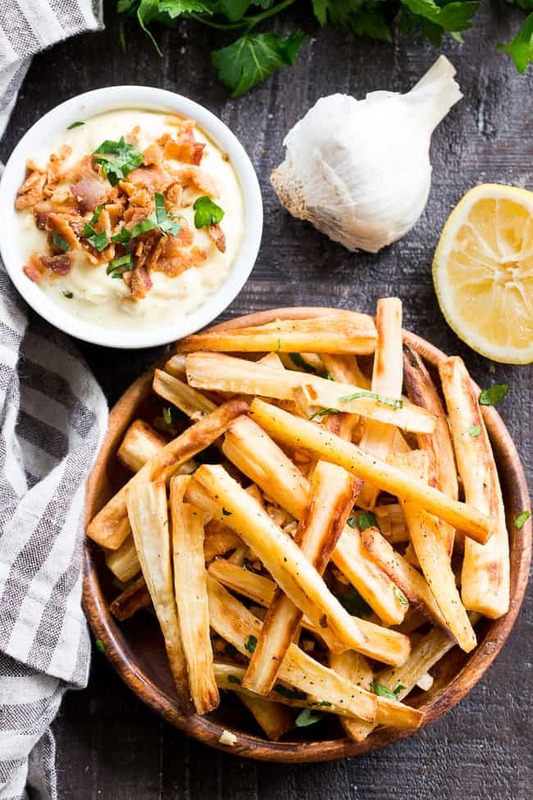 I started out with my homemade mayo – which is very quickly made with an immersion blender – and added some lemon, garlic, spicy mustard and of course BACON to make it into the most delicious dip for these parsnip fries! I hope you guys are ready to eat fries! 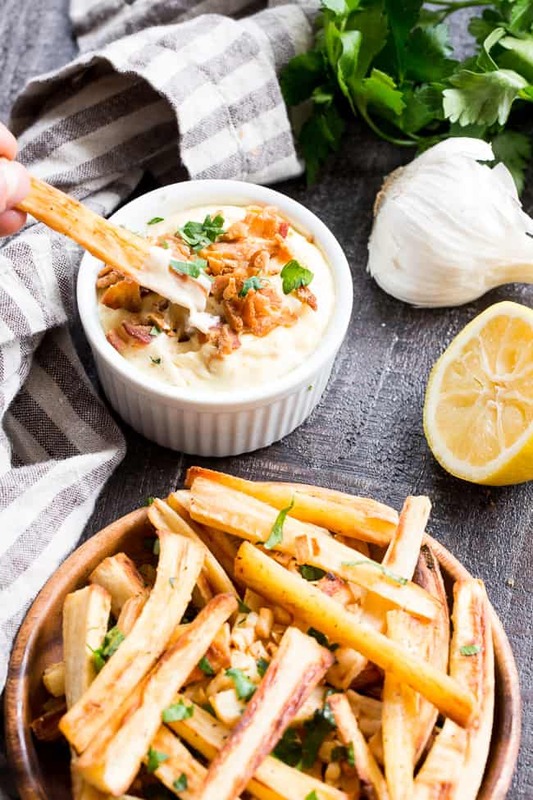 Delicious, paleo and Whole30 friendly crispy garlic parsnip fries with a bacon aioli dip that will make you swoon. 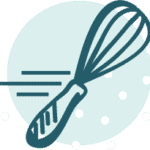 Yes, swoon – some swooning while we cook is a very good sign! Swooning aside, let’s get our parsnips peeled and our mayo made and DO THIS! Hope you guys enjoy! Place in the oven on the middle rack or higher (avoids over-browning!) and bake for 20-25 minutes, until bottoms are beginning to brown. 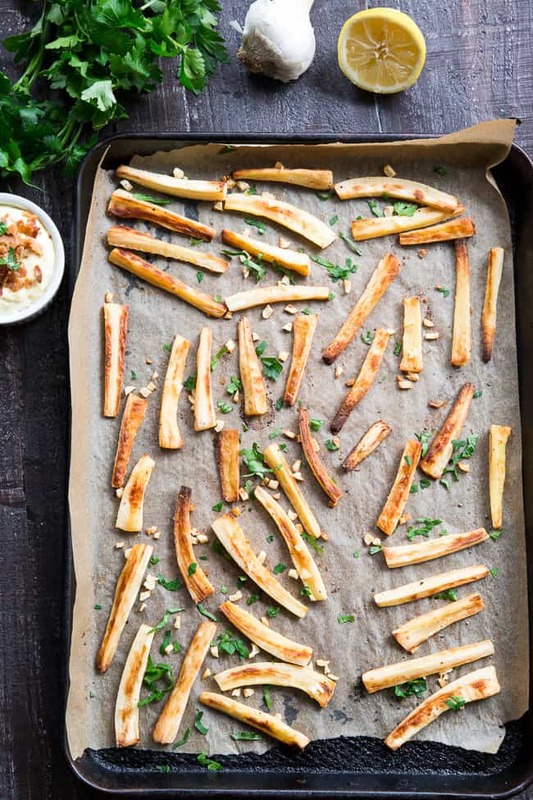 Remove from oven and flip using a spatula, then sprinkle minced garlic all over fries, arrange back into a single layer. Continue to bake another 10-15 minutes or until golden brown and crispy. Serve with aioli as a side dish, appetizer or snack. Enjoy! Whisk all ingredients except bacon in a bowl until smooth. Stir in the bacon, leaving a bit to sprinkle over the top for serving. 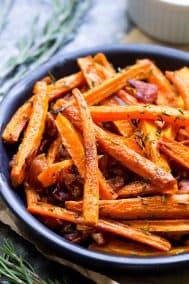 Garnish with parsley and crumbled bacon and serve with fries - enjoy! *Leftover aioli will keep in the fridge, covered for up to 2 days. 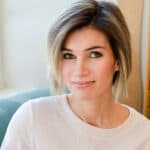 Want More Paleo and Whole30 side dish recipes? Try one of these! 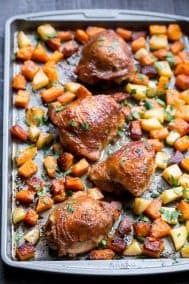 Would this work if I chopped and prepped the parsnips earlier in the day and stored them in a large ziploc bag in the fridge until I was ready to roast them? 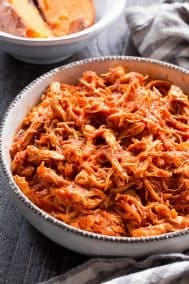 Looking for ways to prep a meal this weekend before going out in the afternoon so it’s all ready to cook when I get home! These are sooo good! First time making them and yum! I also find it easier to prep than sweet potatoes. Nice addition to my roasted veggies rotation! These were delicious. Thank you for sharing. I’ve had parsnips burn before…the parchment did the trick and the Bacon Aioli was a great pairing. Sounds great, so glad you enjoyed! I made these for the first time the other night and WOW!! So easy and so good and let’s just talk about the bacon aioli for a second…AMAZING!! This sauce is on repeat at my house for everything now! We used it on some burgers we made too and topped with marinated onions. So, so good! 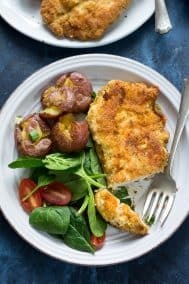 Thanks for another wonderful recipe! I’m thrilled you enjoyed everything! Yup, the aioli is a keeper for me as well! Absolutely delicious. Has become one of my faves.